Thank you Senator Krueger, Assemblywoman Weinstein, Senator Kaminsky, Assemblyman Englebright, and members of the fiscal and environmental committees. 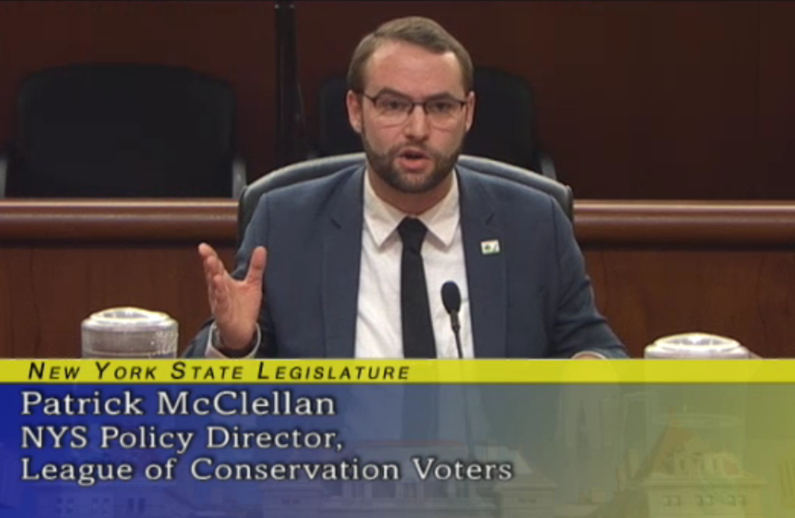 The New York League of Conservation Voters (NYLCV) appreciates your strong leadership over the years on environmental issues and we look forward to partnering with you this year to advance an ambitious climate change and conservation agenda. We support many of the environmental, transportation, and public health proposals in the Executive Budget for 2019-2020. We are especially enthusiastic about the inclusion of a congestion pricing proposal for Manhattan, the Green New Deal to put New York on the path to carbon neutrality, the $10 billion Green Future Fund, expansion of the Bottle Bill, a ban on plastic bags, and disclosure of harmful chemical for consumer products. NYLCV is very excited by the Governor’s announcement of the $10 billion Green Future Fund, including $2 billion for renewable energy and clean transportation; $2 billion for parks, public lands, and resiliency; and $2.5 billion for clean water infrastructure that adds to the $2.5 billion allocated in the 2017 Clean Water Infrastructure Act. Funding for drinking water and wastewater infrastructure continues to be a well-documented need across the state, including to help local governments update systems to address emerging contaminants like 1,4-dioxane and PFCs. We await more details on how these funds will be spent and urge the Governor to include more specifics in his budget amendments. We are happy to once again support a $300 million Environmental Protection Fund (EPF). The EPF benefits a wide variety of environmental priorities in every corner of the state and is a cornerstone of New York’s climate, conservation, and public health programs. We are pleased to see eight new staff for the Department of Public Service to help speed up the siting of renewable energy projects – a top priority for NYLCV – five new staff for the Department of Environmental Conservation (DEC), and 17 new staff for the Office of Parks, Recreation, and Historical Preservation. New York City’s transportation crisis is also a climate and public health crisis. It is the third most traffic-congested city in the world, ridership on subways and buses is declining, and transportation emissions now account for almost one-third of the city’s total greenhouse gas (GHG) emissions. Governor Cuomo’s congestion pricing plan, which would charge private vehicles to enter Manhattan below 60th Street, is a vital first step to reduce emissions, protect public health, and make New York a more livable city. Congestion pricing is working in other global cities including London, Singapore, and Stockholm. In Stockholm, exhaust emissions fell by 14% after congestion pricing was introduced and childhood asthma rates fell by 50%. Improvements even a fraction as large in New York City, where children under the age of four are admitted to the emergency room with asthma nearly 50% more often than children in other parts of the state, would be a tremendous victory for public health. Furthermore, the International Panel on Climate Change’s (IPCC) 2018 report on holding global warming to less than 1.5° Celsius noted that meeting our climate goals will require approximately 20% of current vehicle trips to be avoided through shifts to zero carbon modes of transportation like walking and biking and high efficiency modes of transportation like trains and buses. Congestion pricing can induce those shifts. In London, bus ridership increased by 38% after congestion pricing was introduced, and in Singapore public transit ridership increased by 15%. New York has established itself as a national leader in the fight against climate change. But recent reports from the IPCC and the Fourth National Climate Assessment have shown we are still not moving fast enough to prevent catastrophic climate change. We now have an opportunity to do what many of you in the Assembly and the Senate have long championed: codify a strong climate change law that establishes a national model for transitioning to a carbon-neutral economy. The Climate Leadership Act, which is the cornerstone of Governor Cuomo’s proposed Green New Deal, puts New York on track to do that, as the climate crisis is at a point where we can not rely on administrative action alone but need to enshrine in law the good work we have been doing and the steps needed to further reduce emissions in the future to achieve our ambitious goals. First, the Climate Action Council goes further than working groups that have been convened or proposed in the past by bringing in a wide range of stakeholders, including the Department of Agriculture and Markets and the Department of Labor. While DEC and NYSERDA have special expertise in climate policy, achieving carbon neutrality will impact every aspect of daily life and will require regulatory and budgetary action from many State agencies that do not typically work on environmental issues. We are confident that the scoping plan produced by the Council will be comprehensive, actionable, and reflective of a broad array of stakeholders. Second, the legislation codifies an Environmental Justice and Just Transition Working Group. While the move to carbon neutrality will be a net plus to New York’s economy and public health, in the short term it will be disruptive to certain industries. It is important for New York to ensure that displaced workers and disproportionately impacted communities are given priority for green jobs and other benefits of a green future. This is also an opportunity for the state to redress historical environmental harms that have been done to low-income communities and communities of color. The proposed working group will be vital for achieving these goals. This Working Group must have true input into the State’s recommendations and plans to achieve carbon neutrality. Third, the legislation directs the Public Service Commission (PSC) to initiate proceedings that would move New York to 70% clean energy by 2030 and 100% clean energy by 2040. This is the most ambitious target in the country, and we believe that the PSC, in concert with the utilities, independent power providers, and owners of distributed generation, is capable of achieving it. Finally, the legislation directs DEC to (1) establish a social cost of carbon, which will give us more accurate cost-benefit analyses for regulations to achieve carbon neutrality and better enable the State to use price signals to achieve our goals; (2) codify through regulation the State’s existing goal of cutting GHG emissions 40% by 2030; and (3) within 4 years promulgate regulations consistent with the recommendations of the Climate Action Council. We urge you to work closely with the Executive to enact a comprehensive climate bill as part of the budget this year. We are alarmed by the near-total collapse of the global recycling market as a result of actions taken by the Chinese government as well as long-term trends in the American recycling market. New York is in danger of declining from its current recycling rate and is not on track to further reduce the amount of waste that is sent to landfills, which is necessary to achieve carbon neutrality. While there is much that the State can do to support municipal recycling programs, pulling more glass products, which can be expensive and difficult to recycle, out of the municipal stream is a good start. To that end, we support in concept the Executive Budget’s expansion of the Bottle Bill to cover sports drinks, energy drinks, and ready-to-drink coffee and tea products. Hard cider should also be part of this expansion as it is comparable to beer, which has long been covered by the Bottle Bill. We support the Governor’s non-budgetary proposal for DEC to explore the possibility of expanding the Bottle Bill to cover wine and liquor bottles to understand how those materials could best be managed. However, given the dire state of the recycling market and the volume of glass that was challenging for municipalities even before the current crisis, the State should also consider a stewardship fee on glass and plastic beverage containers which are not subject to the Bottle Bill to support municipal programs during this difficult time. Regardless of the funding source, New York’s local governments need help in the short term to ensure that they can afford to continue providing recycling programs. In the longer term, the State should invest in in-state recycling facilities, especially for paper, support the use of materials with recycled content and more end uses for recycled materials, and enact more extended producer responsibility laws to place the burden for recycling difficult products on producers and consumers rather than local governments and taxpayers. Last, the easiest thing the State can do to reduce contamination in the recycling stream is to invest in consumer education – the average person who wants to recycle is unlikely to know that a pizza box with grease stains on it is not recyclable, or that which of their hair product containers are recyclable can vary by jurisdiction. Consumer education campaigns can be highly effective when properly designed, funded, and implemented. The State should also consider standardizing which products are collected through curbside collection programs. This would reduce confusion and make consumer education campaigns less complicated. It is past time for New York State to address single-use carryout bag waste and we are encouraged that Governor Cuomo included a plastic bag ban in the Executive Budget, coupled with a plan to disburse reusable bags to low income New Yorkers. This is an important first step. However, we must reduce the use of all single-use bags rather than just plastic. The best way to do this, as has been proven in dozens of other jurisdictions around the world, is to ban plastic bags and place a nominal fee on paper bags. By our reading, the Executive Budget only bans plastic bags at retail establishments that are over 10,000 square feet or have 5 or more locations under common ownership of more than 5,000 square feet. These limits were originally drafted when the State enacted a plastic bag recycling law, and while one could argue that they are reasonable for that purpose because smaller stores have concerns about having enough space to store returned plastic bags, they do not make sense for a plastic bag ban. As written, the bag ban appears to not apply to the vast majority of corner stores and bodegas in New York’s cities. There should be no minimum square footage requirement for a bag ban or fee and we urge the Executive to clarify this in the 30-day amendments. NYLCV supports the Executive Budget’s proposed ban on offshore oil and gas exploration, drilling, and infrastructure in New York State waters. Further large-scale fossil fuel extraction goes against the State’s climate change goals and, especially in marine environments, poses unacceptable risks to local ecosystems and the marine and tourism economy that would impact Long Island in particular. Even the exploration of offshore oil and gas reserves, such as the recently approved actions by the Trump administration to allow for the use of air guns, can destroy marine ecosystems hundreds of miles away from the exploration site. The proposed legislation is a commonsense upholding of New York’s values. We strongly support the proposal for consumer product ingredient disclosure. When the United States first began to seriously regulate chemicals through the Toxic Substances Control Act (TSCA) in 1976, the vast majority of existing chemicals were grandfathered into the regulatory regime, meaning their manufacturers did not have to prove to the Environmental Protection Agency (EPA) that they were safe. Since then, we have learned that many of those chemicals are carcinogens, mutagens, endocrine disruptors, or otherwise harmful to human health. While TSCA was reformed in 2016 to expand the EPA’s authority and require it to review grandfathered chemicals, there has been very little action taken since then and New Yorkers continue to be exposed to chemicals that can cause cancer, early onset puberty, hormone disorders, fertility issues, and other serious health problems. New York is federally preempted from banning many chemicals of concern, but it is not preempted from requiring more disclosure from manufacturers to the public. The proposed Consumer Chemical Awareness Act and regulation of personal care products would require manufacturers of consumer products and personal care products to report their ingredients to DEC and the Department of Health (DOH), as well as any research the manufacturer has done on the impact of these ingredients on human health and the environment. DEC and DOH would then communicate this information to the public. Quite simply, New Yorkers have a right to know what’s in the products they are buying. Finally, we support the proposal in the Health Article VII legislation to lower the State’s definition of elevated blood lead level (BLL) from 10 micrograms per deciliter of blood to 5, which would bring New York in line with the Centers for Disease Control’s recommendations. There is no safe blood lead level for children, but lowering the State’s definition of elevated BLL will ensure that more cases of children with concerning BLLs are reported to the Department of Health, which can identify clusters of dangerous lead levels and coordinate State intervention to protect children. We have an opportunity with this budget to take transformative action on many of the most urgent environmental issues. The Governor’s Executive Budget is a strong starting point and NYLCV looks forward to working with you to make it even stronger. Thank you.